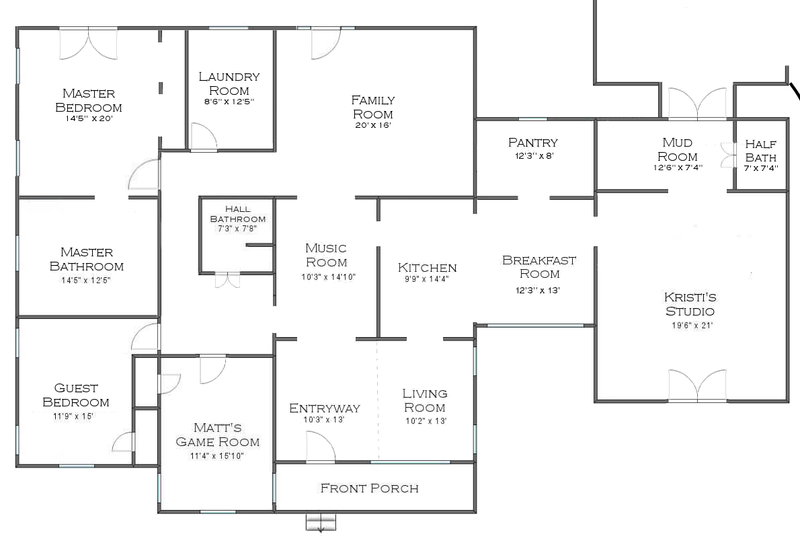 I have been procrastinating in a big way when it comes to the garage-to-studio conversion plans. It’s not that I don’t want it to happen. I do. And I’m very excited about having that space as my studio. The issue is that completely cleaning out and emptying the garage and storage room is such a huge, daunting task that I’ve gotten myself stuck in the “planning and dreaming” stage (mostly dreaming with very little planning, actually), and I’ve failed to make any real progress. In fact, I had even put off signing the contract with the general contractor. But that changed yesterday. After putting it off for far too long, I finally went to the office yesterday afternoon, signed the contract, and got our project on their schedule. The start day will be on or around July 5th. And this time, while there may be a tiny bit of flexibility, there’s no more room for procrastination. Once a contract has been signed and a project has been added to their schedule, it’s pretty much set in stone. So now it’s crunch time. I’ve been thinking through the list of things that I need to do. That list includes things like (1) order a dumpster and have it delivered to the house in about a week, (2) separate out all of the furniture I’m never going to use and get it listed on the McLennan County Buy/Sell/Trade Facebook page and/or Craigslist, (3) get the sunroom cleared out so that I can store and organize everything I’m keeping (including my tools) in there. But the main thing, obviously, is that I need to make some major design decisions. Where do I want doors? Windows? Cabinets? Desk(s)? And the one thing that keeps tripping me up is the question of adding additional doors to the front of my house. Our house won’t have a Craftsman look to it, by the way. It will be much more traditional in style. These are mock-ups that a very generous reader (a retired architect) did for me a couple of years ago. She was going for overall look and not specific details. But you can see that there are still two garage doors over there on the right side of the house. Of course, the doors won’t just be floating there a foot off the ground. 🙂 I’d either build steps down, or perhaps incorporate that door into an extended front porch somehow. I would also add some lights to either side of the doors, and then do something decorative on either side like build some trellises for climbing vines. The point is that while I’m not sure about those details yet, I do know there will be no floating doors with big expanses of blank wall on either side. From an interior perspective, this is my favorite placement of the French doors. I love the idea of them being directly opposite the French doors that will lead outside to the future carport from the mud room (which is currently a storage room at the back of the garage) at the back of the studio. But while I’m convinced that this placement is exactly what I want from an interior perspective, I’m less convinced that it’s what I want from an exterior perspective. One of my main concerns is that when this is finished, I do not want this to actually look like a garage conversion. I don’t want any evidence that it was ever a garage. I want the completed remodel to look totally integrated, especially from the exterior view, so that it looks like it was always part of the living area of the house. And I keep having this nagging feeling that windows on the front will accomplish that goal a little better than French doors will. And the crazy thing is that, for the life of me, I can’t figure out why it is that I even think that. I’ve seen loads of houses that have more than one door on the front of the house. Some of them were originally built that way, others were remodeled to add more French doors on the front of house in addition to the actual front door. But most of them look completely intentional an not like and afterthought or a conversion in any way. In fact, Chip and Joanna are doing a Fixer Upper house just across the street from my mom’s house right now. It’s a narrow house from the front, and yet they’ve added two sets of French doors on the front in addition to the front door. And if you promise to keep this just between us, I’ll share a pic with you. And of course, there are a thousand examples of this same thing on Houzz.com as well. So I’d love your honest opinion. Do you think it would be strange for me to have French doors on the front of the house where the garage doors currently are? Is there something about adding French door there that will make it more obvious that it’s a garage conversion? I wish I could figure out what’s stopping me from jumping in with both feet on the front-of-house French door placement. Perhaps I’m making something out of nothing. Maybe it’s just nerves from the fact that this will be the first major change we’re making to the front exterior of the house, and I don’t want to screw it up. I have about two weeks to make these decisions before my meeting with the project manager. If I can get the window and door placement settled in my mind, I feel like the rest of the studio design will come easily. So what say you? If this were your remodel, what would you do? French doors on the front? Or windows on the front and French doors on the side out of sight from the street view of the house? Next Post DIY Range Hood Cover - Finished! What if you did 2 sets of doors? That was my thought – 2 sets of doors. More balanced and more light. I agree, two sets of French doors would look more “intentional,” the one set looks awkward. She would give up storage but gain more curb appeal and light. Another idea is a “dummy” door or window that is only visible from the outside. We had that when a remodel put a shower in a corner that had a window. The contractor left it a window from the outside but with perfectly fitting shutter permanently closed over it, all painted in the new trim color. Inside it was just walled over. It looked better from the outside than it would have without the window. Hi ..I’m new to your Blog and very Happy to have found fellow tribesmen. I kinda live outside the box so feel free to totally ignore any and all of my suggestions but, Have you considered the folding windows/doors ( Slide/Fold Horizontally) like giant shutters or a reversed garage door.They are stunning and would offer a complete wall of light and when the mood strikes bring the outdoors in. I am loving those folding doors! Excellent for access bringing furniture projects, etc. in and out without having to bump into the door trims. And so much natural light. I think the two windows makes the house look more balanced ….. I love French doors but not in this case. I definitely agree with Loretta. I loved the proposed front with two windows. I also think the french doors on the right side of the studio will let in light from a different angle which might be a great bonus. I’d put the two windows on the front and a french door on the side of the house so that you can have more light and get out to the driveway area from your shop. I agree, I like the look of the two windows better, and you’d retain storage space below them. Is there a definite reason to use French doors? This is what I thought of before reading any of the comments…actually before I got to the photo of the fixer upper house! If that takes up too much of your wall space, what about full length shutters on the single set of French doors? They would give them a bit mor “substance” to the wide space. I also think that two sets of French doors would look better than one..
Honestly… the door at the front does look a bit unbalanced to me. Could you maybe put the door on the wall opposite the door into the kitchen? If I remember right, your driveway is right there, and then it would be easy to load and unload work materials from your car. Just a suggestion, pick whatever you like best! This sounds like a good idea to me because it seems to me that one of the priorities was to be able to get things in and out of the studio easily. For that, it would seem like the French doors would be ideal, wherever you place them. Agreed! I’d absolutely go with the windows! Super cute! I wonder if it’s the one set of doors vs two windows that make the new space seem like a conversion. Most of the other windows on the front of your house aren’t that far from each other, but the single set of french doors is pretty far from another window. I think it looks better with two windows or two sets of doors than the single door set, and the extra space is why it looks like a conversion. Agreed! The two sets bring more balance and weight. Personally what makes conversions look bad is not have consistent exterior finishes like mismatched siding or brick. I don’t think french doors make it look like a conversion at all especially if they match your front door. I think the french doors (both moving) will make it easier to get large projects and furniture into your studio. As to the function of having the French doors, I do agree they may be important to your use of the space. As I look at it, I invision the doors opening on more of a veranda, low-walled narrow patio, or perhaps a walkway opening off to the right. In doing so, I feel it should be edged with shrubs with the entrance to the veranda, patio, or walkway being at the end of the house–opening out to the right corner area. Then, when standing in front, it does not appear to be another entrance with an approach located on the path of the original driveway. From the street, the shrubs (could even be low growing plants) have a defined space and your eye sees the main front door as the only entrance. That’s what I was thinking. I like the functionality of the french doors for moving large furniture/sheets of MDF, etc. in and out. This is going to be your workshop as well, right, building cabinets, etc.? I think that function needs to trump appearances, and to integrate with a porch and/or landscaping choices. You could have a pergola with some vines if a full porch isn’t what you would like. i agree with this reader, that once you complete it with a walkway or shrubs or a veranda it will not look out of place. But- have you considered keeping a garage door? This would make it easier to open for deliveries, ventilation or whatever. It may sound bizarre to have a garage door in your studio but it would be really useful. You could have a patio outside this door for taking things outside to work. And they make very attractive garage doors now. Then also the use could always be converted back to a garage, too. Just a thought! Hmmm, I love those all glass panel garage doors people are using inside houses now. I saw one in a kitchen/dining area and it opened to an outside deck so it was great for entertaining. I agree a garage door would be wonderful for projects, unloading large items, etc. but might not meet your decorative side. I’m afraid if you go with windows on that wall, you’ll hate yourself every time you have to walk around or drive around to load and unload. So strongly consider utilitarian needs for yourself first and then see if you can work in decorative to fit the utilitarian. It might be glass garage door, french door or two, patio area to fit with doors, etc. But your design sense is so good, I know your final decision will be great and work for you. I would go for the windows, it looks more cohesive with the rest of your future design of the exterior. The french doors just seem small on such an expanse of the wall, something seems to be missing just having the doors. If you must have them I would put them on the side of the house. I like the windows too. Even looking at the Gaines house, the multiple doors don’t look right to me. the windows look cohesive. I would do 2 sets of doors and maybe a pergola or some type of “roof” structure to incorporate it into the house. Try a mock-up of 1 & 2 French doors (& steps) with an extended porch. That may work in disguising the fact that it used to be a garage! And add your trellises or whatever on the blank wall in the mock up. I do think the “problem” isn’t the door, it’s the emptiness of the wall / missing porch etc. that makes that end of the house seem off. Add some windows next the French doors. That will make it seem less of an afterthought. Houses today have varying sizes of windows and additional doors. Your rendering makes it very clear that the front door is the FRONT door so I wouldn’t worry about it. Install a pretty patio outside the doors, with a small brick path from the back of the porch to your French doors. I agree–windows next to French doors. You can still have storage under the windows and the extra natural light will be a bonus. And put the stone on the right side of the house also. I think it looks like an addition because it has only siding. I agree, the windows flanking the French doors with a bit of stone siding ties things together and provides balance without matching the other side of the house exactly. or consider a 3door option instead of 2 door? My thoughts exactly, still being able to have storage under those windows. That was I was thinking a window next to the French doors. I do like the look of the two windows better, but what if you added shutters alongside the French doors? Would that be too weird? It seems like something is needed to fill in some of that blank space on either side of the French doors. The functionality of French doors IS appealing. I thought the carport and main entry into the studio space was going to be off the back or side of the house, not the front? I remember you being concerned about having an opening wide enough to bring stuff in from the shed/workshop. – Flank the french doors with regular windows on either side so it looks intentional. The down side of this is that it eats-up wall space (unless you do something like hidden windows that don’t show from the inside). – Put a double-set of french doors side-by-side to take-up more space and make it like a big giant window/door bank. If you want, it cold even be one working set in the middle and blanks on either side. – Omit the front door altogether, put in a couple of carefully placed transom windows, then side the front of the garage so that it looks like functional garage/barn doors (but is really just trim work). That way, it still looks like a garage or carriage house but isn’t. I suppose this might look a tiny bit odd without a driveway in front of it, but maybe you could disguise that with landscaping eventually (a small parking pad or gravel or something). Kristi, i think extending your porch over to the french doors will solve your problem. The extended porch will tie it all in. The windows look pretty, but you want the french doors and i think you should go for them. It wont look like a converted garage once your porch is extended. I love the way your house is turning out. I just looked at your picture again. You need larger doors or shutters on each side to fill it in. Agree with the extended porch idea. Just posted the same thing before I saw this. Agree. Extending the porch will tie it all together. I also agree with the option to keep a garage door. Have you looked at those all-glass garage doors? If you put (one or) two sets of doors on the front, you lose the use of that wall space for storage, etc. Think about why you want doors there in the first place; will anyone come come in and out on a regular basis? Would it be better to have a door/doors in the right wall instead? Or just the rear doors only? IMVHO, any doors on the front will say “garage conversion”. What about having carriage style doors? From an exterior point of view it blends in like a garage but then you still have the double doors that open up to outside. I love that idea. Unfortunately that won’t work on our house.If our house was on a slab foundation at ground level, that idea would work. But since our house is on a pier and beam foundation about 16-18 inches off the ground, and the studio floor will be raised to be level with the rest of the house, the addition of carriage doors floating 16 inches off of ground level would kind of ruin the look. They would be carriage doors leading out to a raised deck or raised front porch, which would be strange. I’d do short windows so you have more wall to push/build furniture against. If another door is a lingering concern, I’d say have it on a side not facing the front (agree, competes with front too much as french doors), and frame it as close as you can(header/top in right place for door to meet walkout), but put a window there. If you do a deck, you have it ready to demo out and go, if not, it still looks finished, and not an extra to-do item. I think a portico over the door, to tie in to the peaks of the roofline, would balance the overall look. Then a lovely walkway, and maybe even a patio, would finish it off. I think what’s missing is “filler” on either side of the french doors. What about full length windows? It will help fill in the big empty spaces and also help the french doors blend in a bit. Are you going to actually “use” the front french doors? Will people be able to see into your room from the street through the french doors? Do you want people to be able to see through them – probably not and you’ll end up with shades/drapes/curtains covering the doors. Sooooooo……..I think you should do the two (2) windows in the front and keep the french door in the back to the carport. Do you ever see yourself in the future having clients that would visit you? If so, I’d definitely consider French doors, whether they be on the front or on the driveway side, so you have a completely separate entrance to the studio. What if you had French doors in front, with two smaller windows (on either side of the doors) and steps down with a walkway to the driveway? That might incorporate the look you’re wanting with the functionality of a studio. I think it’d look wonderful! I like the idea of french doors to let in fresh air etc but I really like the look with just windows in front. Maybe the french doors could go on the side? I personally like the windows, and would put the door on the side. What would a small design consultation with Joanna Gaines cost? Maybe since you are struggling it would be worth checking into. Is there a reason you need a door, in this room, that opens to the front yard? The one set of doors would look good if there was a small covered porch to compliment what is shown at the front of the house or to give a sort of wrap around porch look. Otherwise, they look very lonely and stick out (unless maybe windows on either side as another option). The former garage doesn’t look balanced with the rest of the house they way the mock up is with a lonely set of french doors. Would it be possible to ad to the roof, extend it out to make an over hang, and add a porch with railings similar to your existing porch and entry’s? Maybe that is what Is holding you back. As with the photo you showed of the Gaines’ remodel, the addition also has the roof extended to match the existing roof line. I do like your rendering with the windows, it is the easy way out, but if you want the french doors, maybe continue the roof line? I would put windows, not sure, size, but with shutters matching the rest of the house to balance the look. Put them on both sides of the french doors, add a small portico again mirroring the other entrance and add a lovely walkway for customers. Lots of good points and ideas in the comments above. Perhaps the main problem is with the rendering because you are showing only the French doors. If you can adjust the picture to show the lighting and extended front porch, plus perhaps shutters or anything else you want on the wall, it might help you see what it will really look like. As others have said, what is the purpose of the French doors and do you really need / want them? Good luck! The one french door is not centered outside- while it may be lined up inside to the back wall… this bothers my eye, perhaps its bothering you subconsciously? I would play with 1 window (sized to match the other side of the house, and 1 set of french doors. Extend the porch, add shutters, etc and it will look completely integrated ;-D.
I think if you do a set of French doors and extend the porch, that would look totally normal and intentional. Not sure without the porch extending in front of the French doors — that does sort of strike me more as a garage conversion look. Windows look great in your mock up too. One thing I know — you’ll come up with a great plan, as always! If it were my house I like the idea of the door on the side and the windows in the front, but it seems more functional if the drive way leads up to the door. The proportion of the door to the amount of space on that wall of the garage just seems to small to me. I might also try out the french doors off-set on the front with one window to the side or french doors with some sort of side lights to give it a wider appearance. I also think some really pretty statement wall sconces and or large planters on either side of the door will help fill in the space. If you go with just the french doors on the front will you be adding windows on the side of the garage? I’ve been wondering what’s been happening on the workroom makeover. So excited for you! My first thought is that your largest windows/doors should be where you will garner the best light. Isn’t it always about the light? Also, if you’re planning on having a porch of some sort, that in itself will change the appearance. And though it may be cosmetic… can you ever have too many windows? Could you install some small decorative (?) windows on either side of the french doors? My daughter had a house with a converted garage on the front and it had windows. When she bought it, she took out the driveway(which was a dead giveaway that it was a converted garage) and planted shrubs in front and no one ever knew it wasn’t original to the house. I agree that a driveway is the more obvious giveaway of a garage conversion. French doors or windows both would look great! How often would you really use those doors to go outside and relax? If you want to relax, aren’t there other ares of your home that are more relaxing than right outside your work room? I think that windows look more symmetrical with the overall look of the whole house. If you do go with a set of French doors, I definitely think you’ll need something on either side to “dress” it up. Vines sound lovely. What about atrium doors, triple, to match the front door? The one in the center to open. I think these would add weight to that end of the house and you might even add shutters. I feel that your rendering with the french doors just appears unbalanced. My first thought was to add a pergola over the French doors (extending 3-4 ft) and possibly add 2 sidelight windows on each side of the doors. The scale would balance out that garage wall. I don’t think the french doors compete with the front door then either. Stick with the French doors, please don’t “rethink” your initial vision. The ease of moving pieces into / through the studio is, to me, paramount. You will be able to fully integrate the doors into your master plan. I wholeheartedly agree. Don’t sacrifice function. Some of the other commenters are even suggesting changing the front door. That is a huge expense that would require so many changes to your interior that the commenters aren’t keeping in mind. Both renderings look great although I personally prefer the french doors. Go with your gut. I’m with Barbara H., I think a problem is that your picture above is so unadorned! I really like the idea of putting trellises with climbing plants next to the doors in order to visually fill the space – why don’t you do another mock-up to get an idea how that looks? If you want to use the doors in front for getting (bigger) projects in- and outside, is the porch even a good idea? because that would include weird corners and steps again (I just imagine you trying to shift huge pieces of wood up the porch) – or am I wrong there? I also really like the idea of the door in the middle and 2 windows next to it in order to fill the space visually, but that only works if you can give away the wall space inside the room. it really depends on what you plan for all details, I think – then the solution for that wall ties in with what you want and need. still, I feel your pain, as this is something that would be very costly to undo again and you want to get it right in the first go! I keep my fingers crossed that you come up with the perfect solution!! In your two examples, the one with the two windows really does look lots, lots better. BUT…if you want French doors to give you access to the outside, then you should have them. I think the windows look better for two reasons. 1. There are 2 windows and you have only one French door. Consider doing two?? Yes, it’s the spacing of the doors and windows that tricks your eyes into thinking the space was never a garage. two sets of doors or two windows to tell your eyes it’s original to the house. You love light in your home, so I can’t imagine you NOT having lots of natural light in your studio! The older we get the more light we need to see. At least do windows on the front and door on the side OR door and windows on the front to balance it out. I just can’t imagine you working in only artificial light. Can’t wait to see what YOU decide! This will sound absolutely out of my mind CRAZY…. but what about a camouflaged garage door that appears to be two windows but really is a single section lifting garage door that will totally clear the opening??? I know….I know I told you it was crazy but it would give you the symmetry from the street view, but you would have the luxury of a front opening to conveniently unload……???? From a balance perspective, my preference is the two windows with a door on the side or just the back. What is your reasoning for the French doors will you need more access than the back entrance will give you? Natural lighting in that space could be addressed well in that space with skylights. Look at your main goals with your room and how the space will serve you best…the rest will follow. Double French doors are very common where I come from. It’s a very European look. That being said, they usually open to a patio for convenience’s sake and also their design is related to air flow coming into the house. I lived in a house that had 4 interior courtyards and ergo doors to go into them. The courtyards were designed around the bedrooms so they would get cool at night. Your pretty house looks like it would benefit from windows in the front of the house. But, only you can decide that. Not sure if someone has said this but what about transom like windows or oval ones set higher up on either side of the French doors, that way it’s balanced from the outside and doesn’t use all your wall space on the inside while still adding natural light. You could still do the climbing vines outside under the windows to help fill the empty space but it won’t be as much solid wall weirdness. In my honest opinion, I think that the French doors make it look VERY “converted garage”ish. That right-hand section of your house is the size and placement of a garage, easily recognizeable to most people, and most homes do not have two front entrances, instead across the front they have one front door, windows across the rest, and then side entrances. If you add doors instead of windows to a section of the house that is visually the right size and placement for a garage, it’s going to look like it was originally the garage. Personally I would stick with windows since you’re going to have a back entrance very close to there, and two other home entrances already. However if you feel you need a fourth entrance to your house, I do think the French doors would be pretty but I would put them on the side next to the driveway. I don’t think it’s the french doors that make it look like a conversion. I think it’s a lack of matching “stone work” on that side. In addition to using the same type of finish on both sides – What about adding some smaller windows on either side of the doors to “balance” out the look? I think the issue with the French door is that it isn’t “going anywhere”… Just a random door. What is the purpose of having a door over there? 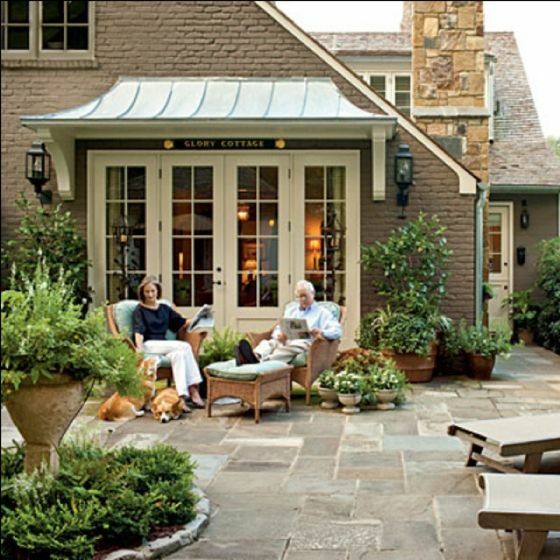 If you integrate it with the front porch, like the Gaines house it would feel more intentional. It would give a reason to come out the front of the house from a different location. If you build it up as a separate entrance that is closer to the driveway that would also give it purpose. But honestly, I think you should do the 2 windows in the front and sneak in the French doors on the side if you really need a second entrance to your studio. That side is where your driveway will be, right? So it is an easy entrance from the driveway without going all the way to the back. But if your main entrance is really going to be through the mudroom at the back…. Why not save the wall space and do windows to give you even more storage underneath. My first impression is that the 2 windows would look better and less like a garage conversion and put the French door on the side. Mainly because there is no other French door on the front of the house to balance the look. And I think that was your biggest concern for it to not look like a conversion. In my opinion, the only place a set of French doors would look good on the front of your house would be in your breakfast room and create a garden area in that little alcove. I know you will consider all options before making your final decision and I can’t wait to see what you come up with! Good luck! What about making it look more like a solarium? I’m thinking a wall of french doors (3 sets? 2 sets of stationary, 1 center set that opens?) that makes it look like this space was designed as a sun room. Even if the outer sets are curtained off inside, so that shelves, etc., could be placed in front of them inside, the look outside would look less like a converted garage. I think the single set with a large expanse of blank wall–even if covered with trellises–does have that converted garage look. I think the photos are making it harder because the two windows looked more balanced and the french door looks smaller with so much wall space around it since you didn’t do the mock up with the trellis’ or whatever you were planning in the blank space. French doors come in a variety of sizes and styles. I think it would look better with an extra wide size with maybe a transom window above (as others have said) or two standard french doors. You could also do a set of french doors with two small windows on either side. You are wanting the french doors for the ease of unloading your lumber and supplies, right? I can understand why that would be easier than taking them to the back. Having a french door off the side seems odd to me and would limit your unloading space, imo. Plus, if you do have customers coming by for consultations, a door on the front makes more sense. Do what you always wanted invisioned!!! You will find a way to make it work with: bushes, decorations, trim, porches, pergolas etc.. If you deviate even slightly your going to find fault with it, pick it to death and eventually redo it. I am from New England and around here *every* old house has been added on to many times. You can always see little hints of where the original structure started and how it evolved from there. To me, that evolution is what gives a house character. A house that is too perfect/seemless/square = new, aka not as much character. I envisioned your french doors with a nice granite slab step in front (another New England staple). To me your French door option would risk looking like a garage conversion only if the structure or steps place in front of it were flimsy or you left a driveway in front of it. I really like this too! 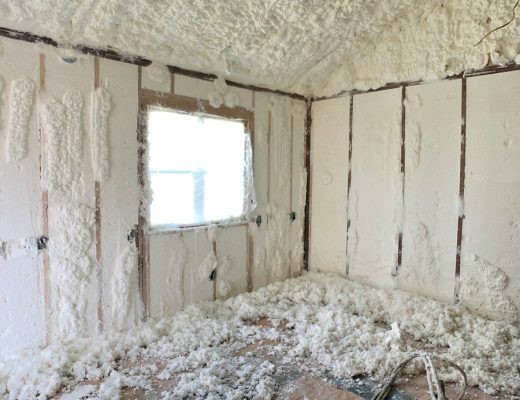 I saw something similar on a This Old House conversion years ago and it is what came to mind immediately on reading Kristi’s dilemma. Fun! The common problem why french doors look out of place is because on garage conversions they are often placed there and then nothing added to them and the driveway goes right up to them. If there is a break in the driveway, a patio, and a porch, etc. and not a driveway leading to that area then it won’t look off. However french doors without a porch or patio area with an overhang does look out of place to me no matter if it was a garage conversion or not and always seems like a water intrusion accident waiting to happen. Go with French doors or 2 sets of French doors.. so much easier .. BUT I just saw that new show on HGTV where the couple remodels a kitchen in Pittsburgh and they out in a garage door.. all glass , black trim… that would be amazing… being able to have all that light and air.. and I know you could make it look awesome… Please think about it.. you are not a window girl.. you are a “wow that is awesome” girl! I didn’t read all the comments, so please forgive me if this is a duplicate. I would space plan first. Windows are easier to plan around than doors. Also what performs the best function? then back into the design. I feel order the skip, clear out the space and then walk through and envision how you feel there. Only then make the final decision. In the end of the day you have to live and work in there. I’ve learned that aesthetics count but in the end of the day it’s yours and you need to live. Would it be the end of the day that some people feel it’s off that you don’t have two french doors but you benefit from extra wall space to live out your creativity, then so be it. Would you love to throw open two sets of doors on a Spring morning while you are working, then do that. In the end of the day it wall always be off to someone. Do you have to love the space you living in? Absolutely! I think in the rendering its visually thrown off because the visual weight isnt balanced. In the picture with 2 windows on studio conversion you have more weight with the 2 windows and dark shutters. I think you should go with what you believe will function better…1 set of french doors. You can easily add more details in real life to make it have better curb appeal. Some ideas….add a peak that mimics peaks above front door, add a pergola and a low brick wall with stone walk way, or add stone/brick to exterior wall similar to front of house. I definitely think the studio side needs some stone/brick either on house or as a short wall for small courtyard. I think its just having the siding that makes it a little obvious it may have been a garage. If u do just windows i think you will always regret not having a door. Dont doubt yourself! You can make fren h doors look awesome, You have skills! I think the reason the french doors work on the Fixer Upper house is because they open onto the porch. Thats why they are not floating. So, you need to somehow extend the porch look or add something heavy enough to balance off with the porch to make your french doors not look like they are floating. – First I thought: It would add a lot to your costs, but if you added a gable on the front of the garage to match the gable over the future porch in the architect’s mock up and then built out in front of the french doors a porch to match the future front porch, then it would definitely not look like a garage conversion. That would be a lot of money. You could do the french doors and dress up that porch nicely. But, if you did that, having the porch (with a roof, etc.) might reduce the functionality/access/loading ability that you’re wanting from those french doors in the first place. – Second I thought: French doors with a trellis and deck? – Third I thought: French doors with nice steps, a trellis over a stone patio with outdoor furniture and a nice hedge or stone wall surrounding it. A stone wall around a secret garden with a wrought iron gate might look cute! But, I have no idea how it would look driving down the street and in relation to the rest of your neighborhood. My worries are that anything you do outside to add privacy/define the space/make it look less like a garage conversion might reduce the functionality/access. But, it might look nicer? Regardless of whether you do doors or windows, I agree with the comments about adding stone to that side of the house and re-routing the driveway and doing a lot with landscaping to remove any remnants of the garage. That will be a lot of work on the outside. If you go with french doors, I agree with the comments about there needing to be side lights or more windows or iron work or something to fill up the wall. Some of those options might limit the functionality of the wall inside. I don’t know! This is a tough one! You’ll figure it out, though! I’m sure of it! I work with furniture and bulky stuff. Keep a garage door and add one window. The nice wide space to maneuver things would just be amazing. The windows look the best, but a door would be more practical. We have a beautiful view, so we installed a 12 foot slider in our living room. It has 4 panels of glass and the 2 in the middle slide open to each side. I know you don’t want a slider, but I think maybe a 4 panel french door would look good. Then landscaping/hardscape would help balance the look. I think you should have 1 set of French doors, with an integrated threshold at floor level (no step/curb) and a small deck/patio outside at the same height. That way you can easily move furniture outside to do some touch up sanding, or painting with products that have noxious fumes, without having to worry about moving the entire piece back to your garage shop. As often as you work outside, I really think both your shops need an easy access to the outside for stuff like that, even if you’re thinking about doing most of your sanding in your other shop. I like both versions. For me, I would want french doors, plus maybe on either side of the doors, some 2’hx4’w windows, running horizontally about 6-7 ft. high on the interior wall. That way you still have abundant light, plus room for cabinets/shelving and you add to the outside elevation. We were forced to add a window to our master bedroom,on the only space I had planned for the headboard. Solution was the horizontal window! It actually was a happy problem solved, because we ( and everyone else ) love what it does for the room! And since we are early risers, the early light doesn’t bother us. I like the idea of the French doors – one or two sets. I do think the things that make garage conversions look like garage conversions are 1) not matching up the exterior siding exactly (complimentary doesn’t work here for me), 2) not matching up the windows exactly, and 3) not choosing complimentary doors. Another thing that would help, and you mentioned it, is continuing the porch over the old garage front – no one would think “garage” when seeing a porch located there. In my head, it would seem like something like this: https://www.pinterest.com/pin/111745634483691294/ or maybe even something more like this would feel like it was more intentional: https://www.pinterest.com/pin/398357529525426564/. If nothing else, adding large shutters on either side of the french doors might feel better when looking at your elevation. I also agree then a small pergola over that entrance with maybe some sort of patio or deck would also make it feel like it was always intentional. But instead of going with just one, adding multiples or even just having the one set be much grander seems more appropriate given the size of your house. It’ll be great no matter what you do! I didn’t read all the comments either, but here are my thoughts. If you are keeping the driveway, perhaps a door for loading might be best. If not, I like the look of the windows instead; they give you the seamless integration you want. I’m in a decluttering/downsizing crunch myself so I can relate to your face smacking, hair pulling angst. We’ll get through it. I’m curious – what would be the purpose of the French doors in the front? Would you actually use them? You would park around back, so anything large that would need to come in would come in those double doors. I do like them if you ended up extending the porch all the way over, but otherwise I think windows would look more cohesive and less like an add on. You could run lower cabinetry along that entire wall and even put a sink under one of the windows (I love a window over a sink ;-). I think the issue is that they are just the french doors. If you used the space just outside of the breakfast room as some sort of outdoor patio (especially if you use an extended porch idea like you suggested) it would look like it was meant to be there. I think adding two french doors as some have suggested would look even more like a converted garage (cut out the garage doors, replace with french doors). I also like the idea of additional windows. Kristi, the main differences I see that seems to integrate the doors into that house is (1) there are two sets of doors and (2) they open onto a covered porch. On your home, 1 set of French doors leaves too much room on either side. Also, most French doors open onto a porch, patio, or a veranda of some sort so there is a ‘reason’ for the doors to be there. With the one set of doors that is shown on your plan currently, my first thought is “why is there a door there”. It seems to lack some cohesiveness with the rest of the exterior. What Connie said. French doors need to lead to an outdoor living space or at least a trellised area. The single French door on the large expanse is awkward. A little late but here’s my 2 cents worth. Originally I thought that you wanted french doors so that you could unload and bring in large items like lumber etc. so for that reason I too vote for the french doors …2 sets one looks lost on that large wall. Personally if this fact wasn’t important then I would say windows all the way. Yes they do look better on the facade and are probably are more secure, but you want this to be a workshop , so you will need that access. Since I am commenting can I just add that somehow your entrance from your mud room into your work space and then into the kitchen doesn’t work for me. I really think that a wall is needed between your mudroom entry so that it funnels directly into your kitchen without going through your workspace.If your like me, I’m not that neat when I start a project and need to just be able to close it off from view. Still so impressed with all you do. Put shutters on each side of the french doors. The only reason the windows look better in the picture is because there are shutters. The single french door looks lost. What if you do the French doors in the middle and then windows on each side? The single french door seems a little lost on the big wall and screams that it is a converted garage but if you frame it with Windows on each side it will make it appear more finished and part of the house. Then you get the best of both worlds. The shutters with the windows make it look more balanced and not like a conversion. There might be something you can do with the doors to make that look just as good if you really want a door. I like the way the house looks with the two windows on the garage wall. Just my opinion. If you decide to go with a French door, then I think two are needed for balance. I wonder, though, about the placement of the small bath in the garage. Wouldn’t it make more sense to have it on the opposite wall of the mudroom, closer to the water supply? Didn’t read through all the comments so not sure if someone mentioned it but I would put the two windows on the front wall and in the alcove I would put an entrance into the workroom. So the door would be perpendicular to the front windows. Does that make sense? You will have a walkway to the main door anyway and you could just put a couple steps to the alcove door for customers and direct access to that room from the drive. I think the single set of French doors look lost on that expansive wall. What about folding doors that completely open the room to the outside? This, of course, would negate any storage in front of the doors on the inside unless you built shelves above the doors and installed a library ladder. I would at least do two sets of French doors though and build a narrow trellis above on the outside, plant some wisteria or clematis, and put down a paver patio with a bistro set in front of them. You could also build a small partial rock wall at the edge of the pavers that would define the space as an integral part of the house instead of it looking like an afterthought. OR you could do some type of atrium, greenhouse wall and call it a day. Either is great. The french door just needs to be balanced…add “porch” with same roof line as front door to house; add shutters to each side also. Whatever it takes to balance with the rest of the house. Ha, I know you’re on to great ideas and will pull it together — look forward to seeing what you do. I would imagine if you removed the matching shutters from the windows on your mockup they would look disconnected as well. Have you considered matching shutters for the French doors? They would be longer than the window shutters but no more so than the front door. Once you add the lighting and trellis (and possibly a porch extension!) you mentioned, it could be quite lovely. The convenience and sensibility of having a dedicated exterior entrance on your studio is well worth the effort to make it work. Kudos to you on your progress! Your home is getting more beautiful by the day! In our area of the country, the model home in a new development has the garage area as the sales office. Instead of garage doors, they put in French doors. Most people who wind up buying that house leave the French doors and using it as a family room. But to me it screams garage conversion. I think the windows would look better and put the French doors on the side of the house that you can’t see from the road. If you run the driveway up there you can unload into your worship. WOW, you have a lot of ideas to consider. Here’s my 2 cents from reading some of these and looking at the rendering. 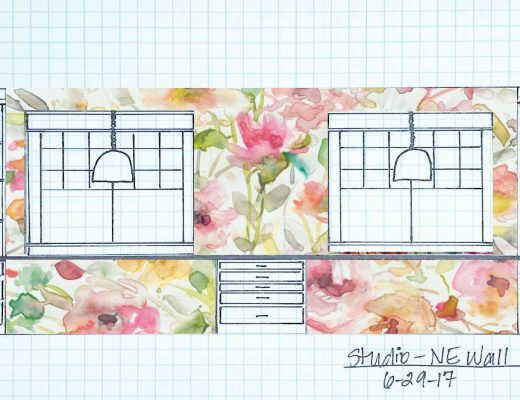 Consider that you may someday do work for clients and need to get furniture in or out of the studio. I would do the windows in front, and a big door, doesn’t matter if french (but would let in more light), on the right side of the studio, so it isn’t seen and doesn’t detract. If the driveway goes around that side, all the better. Easy to load and unload. I like the flagstone idea in front to foster the garden idea in front of the windows. Good luck! Most definitely, I would do windows in front and french doors on the side. If you are driving in with items to unload, that would make the most sense- and we know you love to pick up furniture that you love to redo! It would look much more like it was original than a garage conversion. Can’t wait to see what you decide! I actually love the French doors and the practicality of having a way to enter from the front. Unless I’m crazy, which is a distinct possibly, I thought you had mentioned at some point that you wanted doors in front to bring in lumber that might be bulky and unwieldy through said doors. So why not dress them up with full length shutters? That might be a good way to distinguish them from the front door and dress up the side of the house so I definitely doesn’t look like a conversion. Whatever you choose to do, I’m sure it will be perfectly gorgeous! So many opinions! I personally love the windows out front and I actually like that it’s all siding and no stone. Garage conversions are very evident when the driveway is still in the same place and/or the windows or doors are the same size as the garage doors. Primary consideration should be given to natural light, loading and unloading, and enough wall space for your needs. 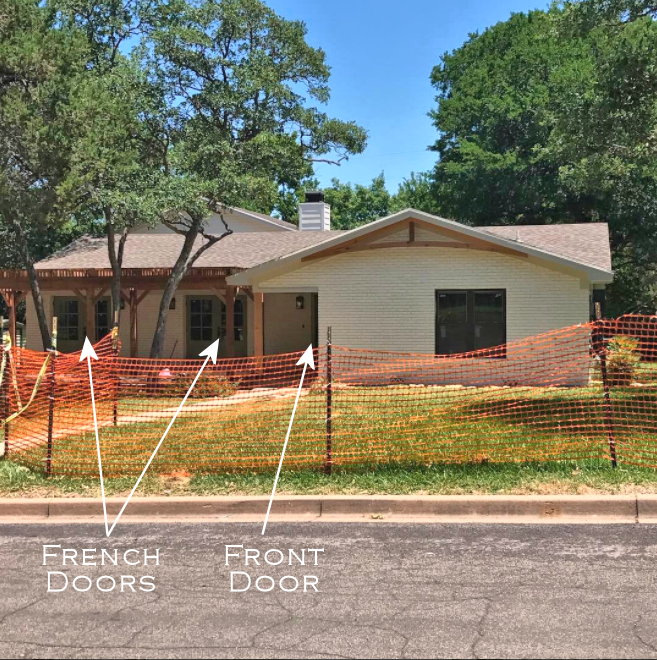 If you do decide to keep one set of French doors up front, I’m sure you could work wonders with trellises and landscaping to compensate for the unbalanced look. I’m just not a fan of 2 front doors. I can’t wait to see what you decide when weighing in all the factors that are important to you. I find the street appeal with the two windows with shutters either side would be better than French doors. Use your door wisely out of site, good for security alone. I’m sure you ÿou come up with a lovely completed new area. I would have to see the layout to see how the french doors would go in that workroom/studio, but I don’t think they make that look anymore like a garage than the windows. I think you just have garage in your head when you see the structure because that’s what it has been. And the idea of a door rather than windows makes it seem like more like the garage to you. I had a similar house and the garage doors were in the back with the drive way hooking back there so that the doors were not visible from the street and the exact windows you are proposing were on the back of the garage which faced the front yard. So, to me the windows remind me more of a garage and that you are simply moving the garage doors to the back, a preferable location so that there is more privacy, and safety in case the garage doors did not close. Since you asked…both ways look great. I think what makes a garage conversion look like a conversion is when the driveway remains. If grass or some sort of landscaping was done to replace that portion of the driveway no one would question it. Hi kristi, I didn’t get to read all the comments but my husband and I actually live in a house where the previous owners did a garage conversion. It has windows and a side door in the front. It had the same siding as the rest of the house but still looked like a garage conversion or an apartment attached to the house. The mailman actually didnt know which door to go to. When we did a makeover to the exterior, I was racking my brain as to what was wrong that we could fix. We built out our front porch to emphasize the front door and in front of the garage conversion we had a cement guy cut into the driveway about 3 or 4 feet in depth from the house to plant bushes. That really did it for Me! Having the cement go all the way up to the conversion really looks like a driveway up to a garage. I will have to send you a couple of pics of our before and after if you are interested. I would do two sets of double/triple windows. In looking at the pictures of your garage, the garage door appears to be recessed from the exterior siding. There may be some support on the interior. If so, you could use that natural niche for window seating in each set of double/triple windows and have storage built into the window seating. The right side of the studio could be a entrance door for clients, next to a large set of doors that would enable you to easily bring large items into the studio. I like the sliding/folding doors – it seems both functional and architecturally appealing. It also brings the outdoors in and promotes creativity. Keep up the good work, Kristi. I love reading your posts and seeing your progress. It is amazing and inspiring! I prefer the windows rather than French doors because it looks more balanced and symmetrical. I do not like the Chip/Jo fixer up either. It just does not look right to me. Kristi, would you consider getting a local “real life” architect person to do a more detailed mock up for you of the way you *really* want your house to look, with both versions – the French doors, and the windows? You plan to undertake is a major structural change that’s not just an improvement on something that was already there, a la your breakfast room window and wall, but a rather substantial alteration which will effect the way the front of your house looks. I think the single set of French doors would look fine if they were wider and had a small patio or porch in front of them. Maybe if they tall plantings or potted trees on either side, or had full-length shutters on each side, that might take up some of that wall space so it doesn’t look like a lonely set of doors on the outside of the house. Like this: http://italianmadehomes.us/wp-content/uploads/2011/12/Classico-Exterior-Shutters-5-900×778.jpg or this: http://perfectfitshutters.com/wp-content/uploads/2014/08/Raised%20Panel-27-472×317.jpg Otherwise, the two sets of windows do look more like they could be original to the house. This progress is exciting, and I can’t wait to see what’s going to happen over this late spring/summer with your house! Try mocking up either two sets of French doors with a minimum of 12 inches in between so they span a great width. Another option is sidelights on both sides of the single French door, which would add two stationary 12-18 inch glass windows wide to the width. The issue for my eye with the French door is it is too small in width for the expanse of wall. But they have to lead to something and the two windows do look great without creating that issue. As always, you’ve got many commenters here helping you out with opinions – I’ll add mine to the mix! My favorite exterior elevation is the one with the windows. I agree that the french doors will make the old garage look like a garage conversion. I really love the two windows with matching shutters, bringing the line of windows all the way across from the left side to the right. Another thing is that visitors may confuse which door to enter if you have the french doors there. If you put the entrance to the studio on the side of the house, rather than the front, then your visitors and guests are much less likely to try to enter there. So my vote would be for a side entrance, with two front windows. If this is going to be a studio/workshop, I would opt for leaving the garage doors. You can find something that suits you better than the ones that are there there. You could even have screens made for them to keep them open when the weather permits and you are working out there. For bringing in wood and supplies, the garage door makes the most sense, because you don’t have to worry about breaking windows on the doors (expensive). I would then put a door on the right for more light and as an access for those times that you don’t want to open the garage doors. You could either add steps or if it was me and there was enough room, a small landing would be nice. My reasoning has mostly to do with sawdust. Over the years, my hubby has had various places to do his woodworking in the homes that we have lived in. One even had a big dust collector. No matter what he does, sawdust happens!! It takes a LOT of cleaning to keep an area clean when you are working on a project and of course, that is the least likely time to be able to clean because you have so many other things going. AND sawdust seems to gravitate to the windows. If the door is on the side and the glass gets covered in sawdust, who cares?? You will clean it when you have time. If it is on the front, you will feel like you need to work harder to keep it clean. If you are going to have this room, strictly as a place to paint or sew, then having a couple of windows out front, would look the best IMHO – with a door on the side.. However, I think the studio/workshop is more what your intention is for this space. Remember the sawdust and messes that are created while you are working on a project. Just my two cents. I’d go with the French doors and take matching stone ½ way up the outside wall. Add a trellis overhead, and create a patio area with a low stone wall. Put an ornamental tree and/or fountain in one corner and a gate on the driveway side. It will look like you have a beautiful Master Suite. So many great ideas in the comments. I do love the look of the two french doors, with a patio or pergola to anchor that space. Also, can’t you imagine in the next few years that you might want a space for clients to come to you? With the french doors they could enter right into your studio without disturbing your husband and fur-kids. Whatever you decide – I can’t wait, because with you at the helm, it will be awesome! I like the idea of two sets of french door opening to a small covered porch or (if light is a consideration) an open porch/deck ( a nice place to step outside for some fresh air and a different perspective when in the middle of a project) something interesting to sit on between the doors and pretty lights flanking each door. That’s all I got! Whatever you do , it will be fabulous and stunning–you never disappoint! The two windows look more natural or as if that section has always been there as part of the house. I also think it would confuse delivery people about where to knock if you had other doors in the front. That being said, you do need a wide opening for large deliveries, no? Where would that be? Maybe I missed (or forgot) where you said that would go. 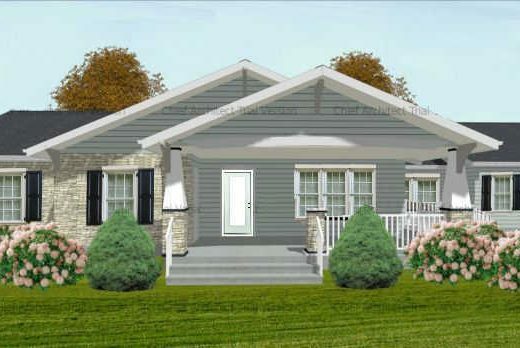 I think extending the front porch, including the overhang, would help the doors look integrated to the house and not a garage remodel. Separate steps (even well done) to me have that “addition/garage conversion” look. keep your French doors use shutters. add a porch that looks like the one you would build for the front door. Landscape in front of the garage conversion and it will look like it belongs. Make everything blend that is the secret. The triple french doors or two windows looks great. If you go with two windows, perhap the french door opposite your breakfast room door. Design the inside of the studio first and leave yourself options for Windows/French Doors. Figure out how the studio itself will work best for you and then figure out if doors work or not. Also, don’t lock yourself into “the doors have to be in the middle”. Maybe it works best with the doors to one side and a window on the other. Maybe it works best with the door on the side wall instead and windows on the front. Maybe it works best with with the doors in the middle and you create a patio to hide the obviousness of the conversion. Either way, I would figure out the inside first and then worry about the outside. I agree. Storage or worktables on wheels keep the space usable when doors are down. Also can easily take a project outside when desirable to do so. Aesthetically, run a large curtain across in a fabric you love and you don’t have to look at them. Bonus, cost of a curtain vs. remodel. How fun to have so many options and talented enough to make them fabulous. I think the windows definitely make it look like it has always been part of the house. The doors make it look like an afterthought. Do you even need doors there? If you need them, then that’s another story, but if you don’t need them, then don’t even think about it. I like the windows best. What I bugs me about the the french door is that there is no apparent reason for it from the outside and it competes with the other side of the house making none of the house the focal point. It’s too busy/too much. On the other house you pictured the doors go onto a patio which makes sense and they remain the focus. What about a placing the french door on the side rather than the front of the house? Where is the driveway going? First of all, beautiful home. I love the layout and what you have done with it, although sometimes you drive me crazy with all the changes! LOL!! I think it would look best and more intentional if there were two sets of french doors on the front, and normally they are leading out to a covered porch. It then takes on a Euro flair. Otherwise, I am afraid it will look like an add-on. Add a little pergola over the French doors . There was an episode of Hometown on HGTV where they did that. That extra detail made it not look like a garage conversion. I am not understanding. Is the future car parking/tool shop area going to be in the front of the house? I thought you had said it was going to be behind your work shop. If it is going to be in the back, then I think windows would be much better looking. If the car parking area will be in the front, then go with French doors. I agree with others that one set of french doors makes it look like a garage conversion. Two sets would look intentional and be balanced. If you ultimately decide you don’t want 2 sets of french doors…2 windows on the front will also look balanced, as if they’ve always been there and not like a garage conversion. I think that a set of french doors would be fine, but what I like about the window idea is the visual balance it has in relation to the opposite side of your home. If there was a way to create that same visual weight and symmetry using french doors it would be the best of all things for you and your happiness. Why not french doors and some windows to balance it out and make it look intentional. I love the functionality of the french doors but all by themselves it does look like they are an afterthought. But if you add smaller windows on either side, you get more light, more balance, and I think it would look more intentional less of an add on. Why not put one set of French doors closest to the main house and a set of 1-2 windows on the other side with shutters? Then you are repeating the window on the opposite side. I photoshopped a couple of mock ups of your exterior, some with a porch and some without a porch. I just realized this post is two weeks old, so hopefully you see this, lol. Anyway, I don’t think the door looks weird at all when a porch is included. My personal favorite is a door flanked by windows. The images are too big for Photobucket, so I had to save them to Pinterest. Sorry about that.